In 1994 two Americans answered an invitation from the Russian Department of Education to teach morals and ethics (based on Biblica l principles) in the public schools. They were invited to teach at prisons, businesses, the fire and police departments, and a large orphanage. It was nearing the holiday season, and the orphans got to hear for the first time the traditional Christmas story. They told them about Mary and Joseph arriving in Bethlehem and finding no room in the inn,taking shelter in a stable, and there Jesus being born and placed in a manger. The children sat on the edge of their seats in amazement as they listened, trying to grasp every word. As a follow-up activity to the story, each child was given three small pieces of cardboard and told to make a manger. They were also given a small paper square, cut from yellow napkins to be torn into strips and carefully laid in the manger for straw. Small squares of flannel from a thrown away nightgown were used for the baby’s blanket. From pieces of tan felta doll-like baby was made. Discipleship training is led by Radford Murphy and begins at 6:00pm in the United Servants classroom. We are now studying the book of Luke. 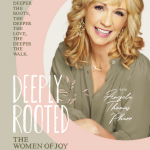 Women of Joy conference in Gatlinburg will be held April 26th-28th.